Join us on a train journey through some of the most spectacular scenery on earth. Along with great views, enjoy great stories, service, food, comfort and fellow travelers. 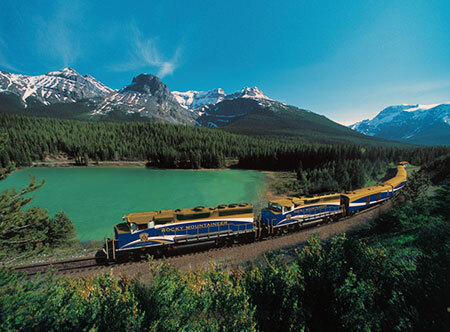 Our train packages are built by combining two day Rocky Mountaineer train trips with hotel stays, activities, tours and transfers that connect all the pieces into one seamless, convenient, carefree whole. We can, for example, combine a two day train trip from Vancouver to Banff with hotel nights in Vancouver and Banff, a day trip to Lake Louise and a transfer from Banff to the Calgary airport. The result is our Canadian Rockies Experience 4 Nights / 5 Days, a compact package filled with beauty, value and great memories. Sorting out components, options, activities and itineraries is fun for some people and tedious for others. We are available to take the work and the mystery out of planning and booking a train trip to Western Canada’s spectacular Rocky Mountains and beyond. Whether you’re ready to start planning or booking a Rocky Mountaineer train journey or just gathering information, we look forward to talking with you. Give us a call at 1-800-913-9207 / 604-990-9299 or Email. These are the packages our travelers request most. One Way – Begin in Vancouver and end in Calgary or vice versa. All these train package bundle your train trip with hotels, guided tours, activities and transfers to give you a complete vacation experience. And you can add a rental car if you like to explore at your own pace. Contact us for more information, reservations, great service and great prices: 1-800-913-9207, 1-604-990-9299 or by Email.